Toadette's Music Room is the second board in the story mode of Mario Party DS. As the name suggests, it is a music-themed board, and its host is Toadette. It is different to other boards as Musical Notes are scattered across the board, and the player can get a Star from it for a varying number of coins. In the entire series, Toadette's Music Room is the second board to have a star being a variable price. The first board in the series was Pagoda Peak from Mario Party 7, only its star from Koopa Master was 10 coins for the first star, 20 for the second, 30 for the third, and 40 for the fourth. There are many features of the board, most of them having to do with musical instruments. Landing on a ? Space on the piano would give the player a chance to earn coins, if they play the notes correctly. Also, there are two horns on the board that blow the player to one space before the music note. If a player lands on one of two large drums, the Hammer Bro comes and knocks the player to a random spot on the board. If a player lands on a violin space, a random character comes to them. Landing on a ? Space near the metronomes causes the musical note and its location to change. 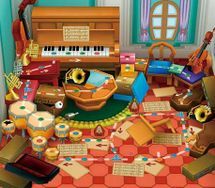 The Music Room, as seen in the game's box art. In Story Mode, it is the second board played. The tiny heroes were making their way to Bowser's Castle when Toadette asks them for help, as a Hammer Bro. was making a mess of her instruments. If the player has the most Stars, they will face the Hammer Bro. in the minigame Hammer Chime. If they defeat Hammer Bro., they will clear the board and Toadette will give them a second Sky Crystal. The star on this board is in a random location. The musical note owns the star. The first musical note has a star which is 5 coins. The player must trade 5 coins for the first star collected, 10 for the second, 15 for the third, 20 for the fourth, and 30 for the fifth, making Toadette's Music Room the only board in which the Stars have a variable price, as well as the only board in which it is legitimately possible to buy Stars for five coins before the Final 5 Frenzy. After the fifth star (which is 30 coins), a star will be no more than 30 coins. The price moves back to the first musical note being 5 coins for its star and the cycle continues. Every time a star is obtained, the note appears in a different space. This page was last edited on November 28, 2018, at 00:16.